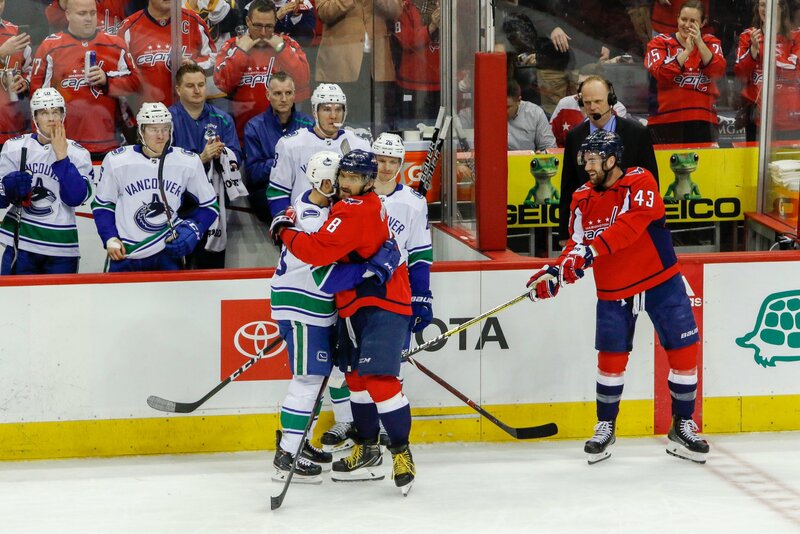 The Capitals’ Tuesday night contest against the Vancouver Canucks was one that carried with it a mix of emotion, with the return of longtime Capitals forward and fan favorite Jay Beagle, who departed the Capitals after 10 seasons last summer in free agency. With such a tenure with the team, the Capitals paid tribute to the hard-working center with a heartfelt tribute to No. 83. The Capitals played the video tribute during the first television break of the game, and Beagle was greeted from the Capital One Arena crowd with a thunderous standing ovation and cheers. Following a long standing ovation from the Capital One Arena crowd, captain Alex Ovechkin came over to Beagle to give him a “thank you” and a hug. Beagle played 471 games with the Capitals, recording 116 points while establishing himself as an efficient faceoff man, and reliable defensive-minded forward and was key in helping the Caps capture the franchise’s first Stanley Cup last summer, receiving his championship ring when the Capitals visited Vancouver earlier this season. Beagle was the last player off the ice after warmups. On the way to the room he grabbed as many pucks and sticks as he could, to give to fans aligning the tunnel entrance. Since signing a four-year deal with the Canucks last summer, Beagle has recorded eight points (two goals, six assists) in 29 games played, with a plus-1 rating. Beagle missed several weeks at the start of the season with a broken forearm. After the game, Beagle told the media “It’s something I’ll remember forever”. This entry was posted in Games, News, NHL, Players, Teams, Washington Capitals and tagged Fan Favorite, Jay Beagle, Michael Fleetwood, Tribute, Vancouver Canucks, Washington Capitals. Bookmark the permalink.